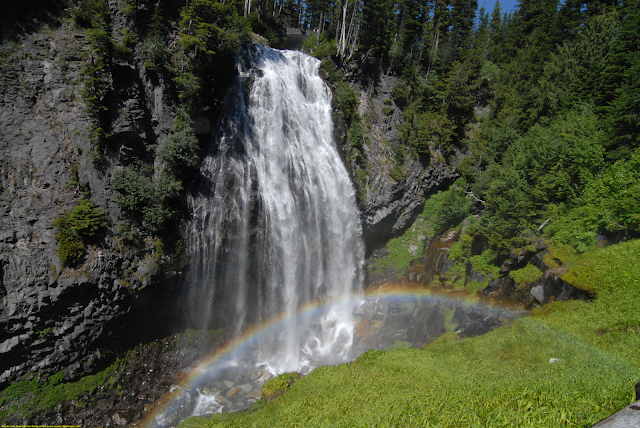 Narada Falls is a waterfall in Mount Rainier National Park, in the U.S. state of Washington. It is said to be the most popular, because the Mount Rainier Highway crosses the falls between its two tiers. The waterfall drops 188 feet (57 m) in two tiers of 168 feet (51 m) and 20 feet (6.1 m). The upper tier is a horsetail that falls in several strands down a nearly sheer cliff, into a canyon that is perpendicular to it. The lower tier is a much smaller plunge. The main viewing area in front of the falls, which probably required us about 5-10 minutes down and double that one the way back up, is consistently sprayed by mist during our visit. While this mist produced a pretty and bold rainbow, it also made some parts of the viewing area muddy and slippery.During the winter, the upper falls freezes and becomes a sheer 150 feet (46 m) of icicles, which attracts many ice climbers.